Boosts the hot and cold water supply to an individual shower, bath, shower mixer or mixer tap. Suitable for positive head applications only. Quiet operation. Centrifugal design. WRAS approved. Automatic switching. Supplied with 200mm flexible hoses. G3/4 threaded connections to pump and 15mm push fit to pipework. 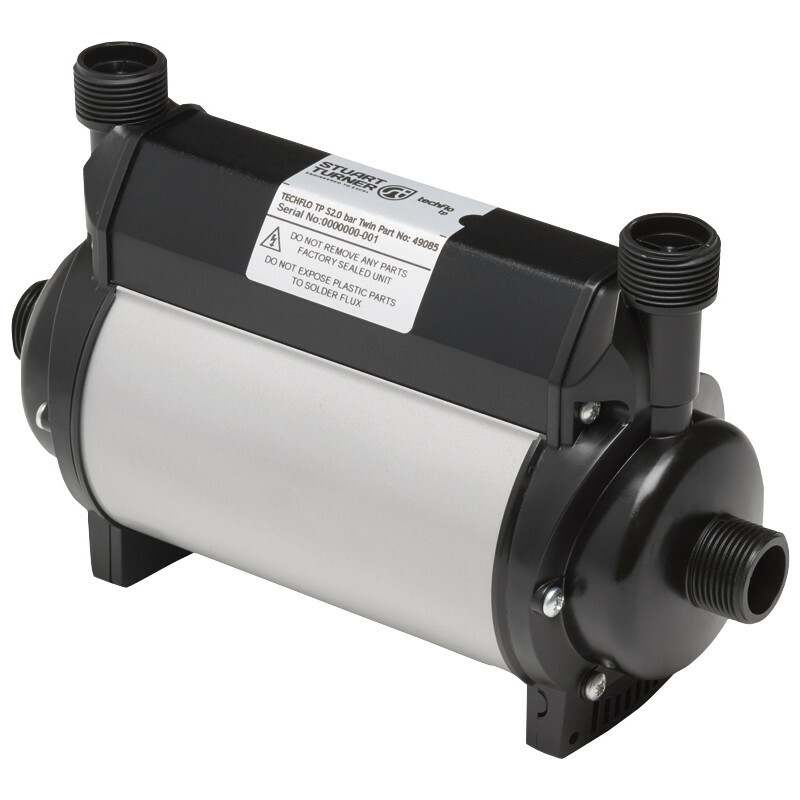 Stuart Turner Showermate TP Twin Shower Pump 1.5 Bar is rated 4.2 out of 5 by 18. Rated 5 out of 5 by Ian 62 from Fantastic shower pump Very good water flow and is so much quieter than the one it replaces. Rated 1 out of 5 by Disappointed 5004 from Cheap & cheerful, but won't last long. Bought one of these as a direct replacement for a Sureflo (no longer made). Did the job until the bearings started to collapse. Didn't last nearly as long as the old Sureflo. Cheap, and I suppose that should be expected. Bought this as a short-term replacement as changing the supply pipework will be a lot more difficult for better makes. Rated 5 out of 5 by TheHat from Works great Only had this installed for a couple of weeks but works great so far and not too noisy. Installed on a gravity fed system that had a very week shower output and now gives an effective shower output. Rated 4 out of 5 by DDH_ from Neat little pump I've used two so far. Initial impressions were spoiled by the little rubber feet coming off almost intermediately on both pumps! They glue back on OK though. The pump was easy to plumb in and runs well and fairly quietly. My main criticism would be that although it produces the pressure, the volume of water it can pump is a bit on the low side. For my shower it's adequate without being dramatic. I can't comment on its long term reliability yet. For a more luxurious shower experience and higher water bills and fuel costs, you can buy a more expensive pump. Rated 4 out of 5 by posset15 from Time will tell..... The pump it replaced ('Showerforce') lasted 15 years, whether this one will have similar longevity remains to be seen. It is however compact and easy to fit despite the very short hoses supplied. (As with a previous reviewer, I used the hoses from the old pump). It is not noticeably quieter than the old pump. Also, the filter washers were missing. Fortunately, ST sent them within 24 hours so installation was not delayed for too long.